NTT Group senior strategist Tsunehisa Okuno outlines NTT's future. NTT Group, Japan's $112 billion communications giant, unveiled ambitious plans for expansion by leveraging its strengths in global communications infrastructure, its aggressive investments in its IT services division, and in the rapid monetization of key technologies and services created by its new Silicon Valley based research center, NTT Innovation Institute. 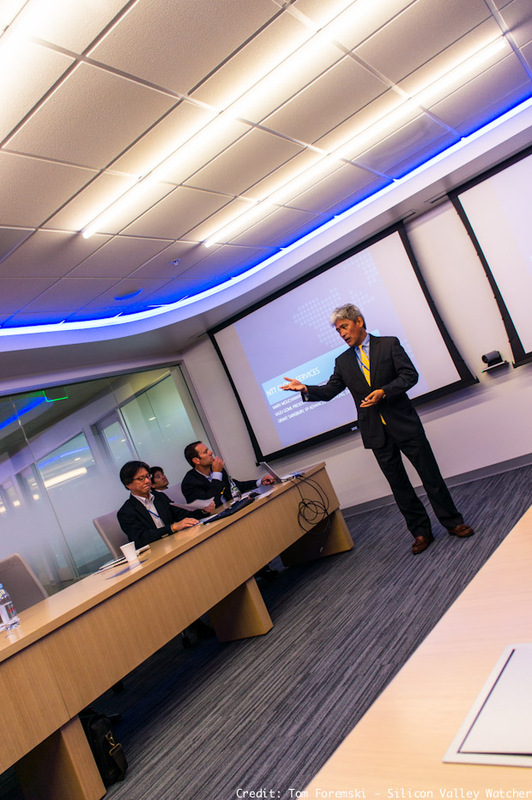 I was the only journalist at a recent strategy briefing at NTT's research and development center in Palo Alto. The company's representatives laid out an ambitious plan to grow out its overseas business into a $20 billion annual revenues operation by the end of its 2016 fiscal year (March 2017), a 33% jump from this year's projected $15 billion. Key to this growth will be integration of its US acquisitions in IT services, and new apps and technologies developed by its Silicon Valley research center. NTT is huge. It employs 240,000 people in 79 countries, and offers communications services in 196 countries; it is #53 in the Fortune 500 and its customers include 80 of the top Fortune 100 corporations. It operates more than 50 data centers ranking it #2 in data centers, and #2 in global IP backbone, and it is in the top ten in marine cable. 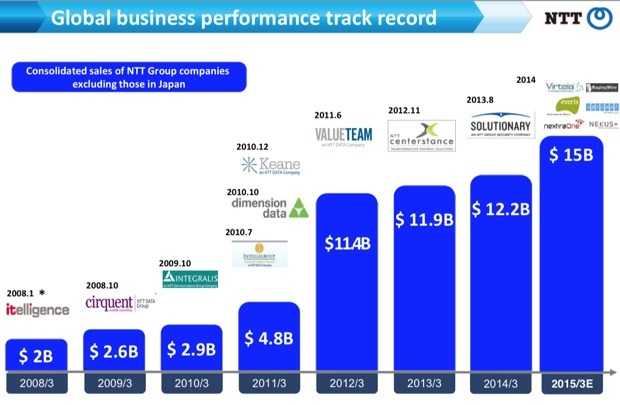 Since 2008 NTT has made many key overseas acquisitions such as Dimension Data, Keane, and Solutionary. Now it intends to leverage those investments into a rapid expansion following several years of slow growth from $11.4 billion in fiscal 2011 to $12.2billion last year. 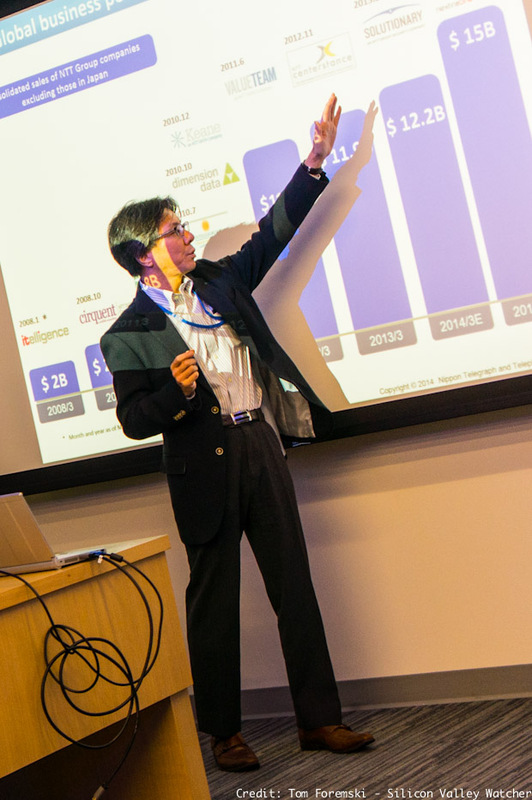 Core to its growth strategy is the expected demand for global cloud services, and for IT services from large corporations struggling with the complexity of managing hybrid IT and cloud computing platforms, said NTT Group senior strategist Tsunehisa Okuno (above). NTT says it now has a full stack of communications infrastructure and data center services for any type of global business. And it has new technologies on the way that will essentially provide a full business operating system that can manage multiple data centers and communications networks, along with an agile software infrastructure to support e-commerce and business operations across a full catalog of data center, desktop and mobile applications. It's a very big picture. It's not only a very ambitious plan but it also has an ambitious schedule of development. NTT wants to monetize its Silicon Valley research center's applied technologies in as little as 18 months, said Kazuhiro Gomi, CEO of NTT America (below). He said that cooperation between the various US business groups such as Data Dimension, and Keane, will be crucial to winning new business and to take advantage of $1 billion in cross-sales opportunities. "We now have the full IT stack for enterprises and we have a global footprint to help them expand. It's how we differentiate ourselves from anyone else." IBM is NTT's largest competitor in IT services but NTT says it is ahead of Big Blue because it owns a global communications infrastructure and over 50 data centers while IBM is trying to fill those gaps in its offerings. IBM is also tied to sales of its own hardware and software products while NTT says it can offer and support a broad range of products, depending on customer needs rather than vendor needs. 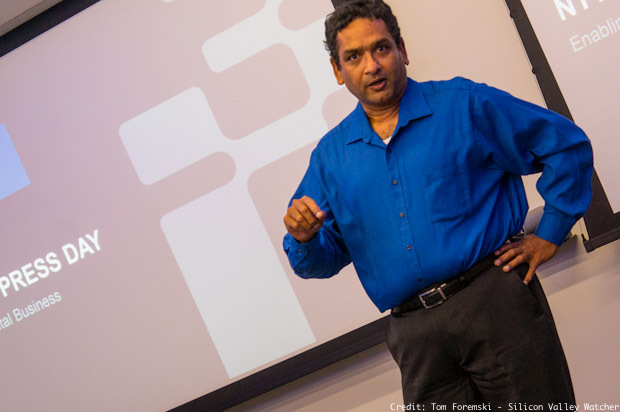 Srini Koushik, CEO of the Silicon Valley based NTT Innovation Institute (above), knows IBM very well. He is a former senior IBM executive and IBM Fellow, and he also used to run Hewlett-Packard's Worldwide Strategic Services business. He's confident that his 100 researchers will be able to quickly monetize more than $2.5 billion of NTT's annual R&D spending and develop critical enterprise technologies. "Every company is a now a digital company and that means they need scalable, secure, and flexible enterprise technologies and services," he said. He is focusing his researchers on developing commercial applications in areas of security, scalable computing, and machine learning. He says that the enormous amount of data being generated by a large digital business, plus the future flood of sensor data and machine logs, will require systems that automatically can monitor and learn from this mass of data. Koushik plans to increase NTT's intellectual property by patenting current technologies, and new ones in development in its Silicon Valley center. 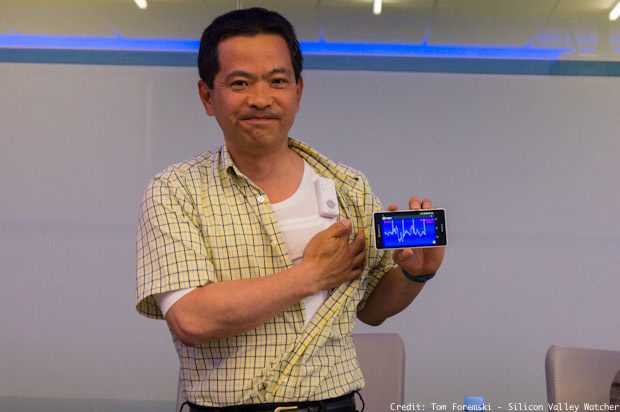 One of those technologies is a washable shirt (demonstrated below) containing biometric sensors that could find widespread use in healthcare (or eldercare in underwear). Foremski's Take:The next two years will be crucial in determining if NTT's aggressive investments in its overseas business group is a successful strategy and one that can dramatically boost revenues following several years of modest growth. Growth of an IT services business is people-constrained and customer acquisition takes a long time. NTT's challenge will be how to effectively coordinate the work of teams from different business groups in identifying customer opportunities and then fulfilling complex IT service obligations. The pace of commoditization of data center computing, storage and communications technologies is another challenge. The deflationary aspect of this downward trend in IT costs means that customers can defer some decisions because the enterprise stack will be so much cheaper tomorrow and the next day. Those economies, however, have to be weighed against business opportunity losses from inflexible IT systems and outdated processes. 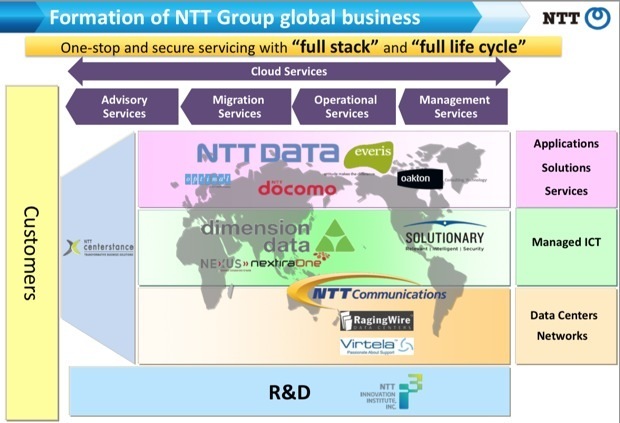 NTT Group is using its IT services to integrate its business groups and acquisitions but a structural reorganization might be neccessary to speed up customer acquisition and services deployment — if it is to reach its aggressive revenue goals. NTT needs to keep an eye on less traditional competitors such as Google, which has a small but expanding enterprise cloud business. Google has an extensive global communications and data center network and recently announced it was part of a consortium financing a marine Internet cable connecting the US and Asia. Its internal business "stack" is looking similar to NTT's. But Google also has a large business: search-based advertising that acts as an important driver in the development and deployment of scalable computing technologies, which form the foundation of its commercial IT services. NTT lacks a single large business to drive similar economies of scale. NTT is preparing a new five-year strategy as the current one ends next year. Will it seek a major Internet business acquisition to complete its business stack?